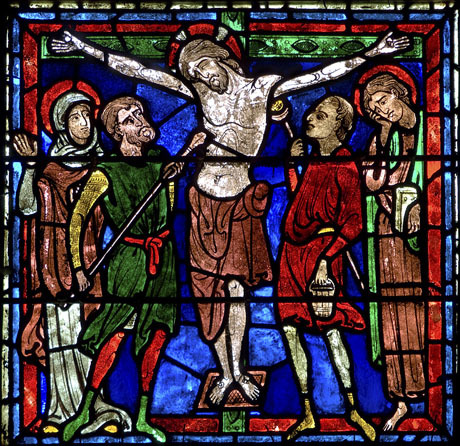 For details of our Easter 2019 services click or tap on the stained glass. What is this thing called Easter? It is a unique, world-changing event offered to deepen the people we are and to help us live with a fresh sense of trust. So, what is all the fuss about? Without the eye of faith, the events of Holy Week and Easter do seem unreasonable. The fact that Jesus chose this route to end his life seems to be unnecessary. Why should a man who had proved himself to be so wise and so loving die in this way? It seems to go against all our expectations of what life is about. It simply takes things too far. And yet the very fact that it goes against all our natural expectations is the point that Jesus makes. He knew that if we human beings were ever going to learn to fully trust in God with our whole selves, we needed a symbol like the cross to help us do so. In the events of Holy Week we see the world being unmade. All the things that we human beings put our trust in let Jesus down. The so-called justice of the state, the so-called goodness of the religious, even the friendship of friends, all came apart. In reading and thinking about these events, we think about all the hurts in our own lives. Instead of doing this by ourselves, we do it with Jesus and with friends. The result is that the sting is taken out and we are helped to re-find a sense of trust. The events of Holy Week force us to look at our own humanity and the people we have allowed ourselves to become. The surprise is what we find there at its heart. On Easter morning we have a sense of life in all its fullness. The unnaturalness for us is that this love includes our hurts and failings and helps us to include them for ourselves in a much wider pattern than we could have created for ourselves. This is why Easter is so liberating and so wonderful. This is why Holy Week and Easter are worth celebrating. Christ is risen! He is risen indeed! Alleluia! Read the front page of this week's noticesheet.